A happy Zari was spotted at her mom's house in Munyonyo lifting her spirit days after ex-husband, Ivan Semwanga, died. It's exactly 12 days since the Rich Gang President passed on at a hospital in South Africa. Zari, 36, seems to be on her feet again and ready to face the world. "It's all about learning how to dance during a storm," She wrote on her Instagram. The mom of five was clad in a blue embroidered kaftan dress that showed off her amazing body. She completed it with silver heels. In one of the pic, she was right by her black CLK 500 merc with 'ZARI 2' reg plates and in another, Diamond Platnumz' baby mama holds the dress a little to expose her huge behind. "I really love this. In most cases we focus on closed doors and miss out open doors, way to go hun don't just dance in the rain walk on water its time to put yo family together and face the future." "I think it's time Tanzanians kumkubali Zari by force, guys she's a super mum, an iron lady, unbreakable kwani hamkuona au kuckia interview yake juzii? ?Kila kitu Kiki clear, let's be positive there is life after Ivan's death do you guys expect Zari alegee Na watt je? Lazima ajikaze ajikurupushe kwasababu ya watt?? ?Wacheni chuki instead be inspired na.."
"They should leave you alone beautiful! You have gone through a lot right now you don't need any lecture. Be strong Zarinah we love you and I prayed for you and your kids today at church families God to see you through honey.."
On the left is Don Bahati throwing money in the grave while on the right, Zari and the children look on as the casket is lowered. 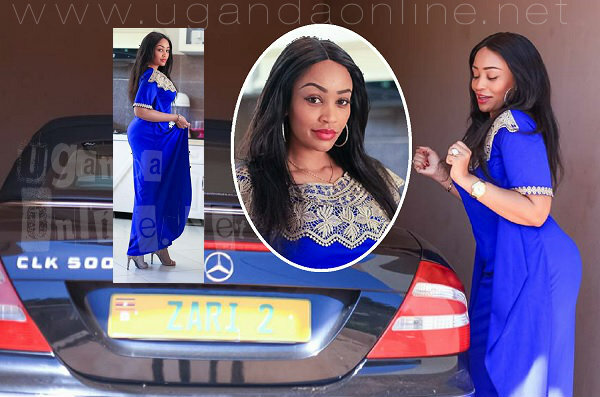 Zari is still in the country to sort out some issues to do with her ex-husband's property here in Uganda and also to attend a Semwanga family meeting that will resolve on how the properties in South Africa are to be managed. King Lawrence who could not catch a flight just in time for burial is also around. Things appear to be more complicated after it turned out that while in South Africa, Ivan was using a different name. He was using the name Ali Senyomo and that is the name under which the body was registered. It's no wonder some people were of the view that Semwanga was probably not dead, why, because they had not seen the body and were not allowed to, and at the airport, the body that was received came in the name of Ali Senyomo and not Ivan Semwanga. This and many others like Zari appearing less bothered just went on to assert that may be Ivan was not dead. Audio clips with claims that the fallen socialite was alive spread like wildfire on Whatsapp forcing the family to release the pics[Ivan in coffin] that had earlier on been hoarded to confirm that indeed, he had breathed his last. On the issue of trying to claim for property, legally, a death certificate is required, but in this case, there's a certificate of Ali Senyomo which might cause some complications and delays especially for Zari and the children. We will keep following this for you.